Mr. Ortega, what do you do for living? As a director, what do you do in that arena? And as a choreographer, what type of work do you do? I work less as a choreographer now, more supervising as a choreographer but in the day, I would create dance routines, dance production numbers, dance sequences. How long have u been a director and a choreographer? In addition to film and television and stage, are there other productions you have been involved in? Did u know Michael Jackson? When did you first meet Mr. Jackson? And do u remember under what circumstances you met him? And you took him up on that offer? What was your role on the Dangerous Tour? I was the co-creator of the show itself with Michael and I was the director of the Production. In addition to the Dangerous Tour, prior to ‘This Is It’ were there other tours that you were involved in with Michael? Yes. I also was Michael’s co-creator partner on the HIStory Tour. And also couple of other one-off concert productions for charity. What do you mean ‘one-off’? Not part of his Tour. Special concerts that were done for charitable reasons. Your professional relationship with Mr. Jackson, was it always as u described as co-director or co-creator? Can u describe your professional interaction with Michael in that capacity as co-creators? He was just extremely creative. Enjoyable. Fun. Inspirational. Michael and I would meet and begin at the beginning. And have an entire creative process, sculpting out the ideas for the production, from the music, staging, effects, lighting, everything that attributed to the whole of the production. And in these areas, the music, the dance, the staging, the effects, the lighting; would Michael be heavily involved in all of that decision making? Yeah. I did not do the choreography. Michael did the choreography, and also did choreography with other choreographers. I supervised the choreography but did not do the day-in, day-out creation of the dances. Many of those dances were there before I started working with Michael. In those other areas, costuming, lighting, sound, the staging of the production, illusions. In between tours, for example Dangerous Tour, you mentioned the HIStory Tour, what type of personal relationship, if any, did you have with Mr. Jackson? We had just a great friendship working together as professionals. I didn’t spend a lot of time with Michael when we weren’t engaged in a production. But over the last few years, we did keep in touch a little bit more often; saw each other on occasion, talked on the telephone. Following the HIStory tour, what was the next tour you were involved in with Michael Jackson? How did u become involved in on the ‘This Is It’ Tour? I was first informed by AEG that Michael had an interest in involving me in a planned Tour then Michael reached out to me personally. Mr. Jackson contacted you directly after that? And did he ask you to be part of that Tour? Can u describe that conversation please? Just that he was very excited and he used the expression ‘This is It’ a number of times during the telephone conversation. I remember saying to him ‘you should just call it this is it, you said it so many times’ he was just very excited. This is it. This is the time. There is great reason to do this now. I am excited about this and I want you to be part of this with me. Will you do this with me? I was involved in other projects at the time but I told Michael that I would do everything I can to clear myself so that I could be a part of it with him. And were u able to do that? When did u start working on the ‘This Is It’ Tour with Michael? And what was your role to be as part of that production? As co-creator/co-director, was it again the same type of professional relationship that u described from the earlier Tours? And was Michael equally involved in the decision making as it related to the music, the effects, the lighting, and all the relevant details? So beginning in mid-April 2009, how often would you see Michael Jackson? In the beginning maybe 3 to 4 days a week. Did that increase in regularity at some point? Yes. Probably 4 to 5 days, it increased to. And this would be at the wherever the rehearsal was being…. That’s where the rehearsals began? Yes. Also that’s where our creative conversations began. What was happening at Center stages during this initial phase of preparation? We were having creative conversations, Michael and I and Travis Payne the choreographer about how we would lay out the production. Michael had music ideas, staging ideas, and we were basically building the show conceptually. Yeah, building it from scratch as ‘This Is It.’ There would be elements incorporated into this production that Michael had done before but it was a new show. And beginning in mid-April, with these 3 to 4, eventually 4 to 5 visits with Michael a week, can u please describe his demeanor and his level of involvement in the preparations? He was very excited. Just convinced that this was the time. He had great reason to do it and believed that we had the potential to something really important and wonderful. Did he specifically relay to you reasons why he though that this was now the right time to do a Tour of this magnitude? He had many reasons but I would say the most important reasons were that wanted to share what it is that he loved all of his life with his children. He wanted to do it for his fans who had been loyal to him, whom he cared deeply about, he loved very much. He also wanted to do it because he felt now more than ever, that his music applied to our world situation. “Earth Song” “Will You Be There” “Heal The World” and other songs and he wanted to use the stage as a platform to remind people the importance of us doing whatever we can to take care of this planet and each other. And he relayed this to you? What did he tell you about his desire to put on a production of this magnitude for his children? What did he share with you in that regard? Just that he was excited. That they were fans of his work and now they were of an age where they can really appreciate what it is that he did so he felt now was an opportunity for him to be able to share it with them. During the rehearsal stage at Center Stages, and after Center Stages, where did the rehearsals move to? Did the children attend any of these rehearsals? Was there a reason they did not attend the rehearsals? Michael was waiting to bring them to see shows in London and wanted them to focus on their schooling. Did Michael plan on bringing them on tour to London? The children would no longer be in school during the summer months of the Tour? The fans. You say the other reason was the fans. Did he express those thoughts to you specifically? Yes, he actually was letting the fans vote on the music material that they wanted in the show. He had an incredible relationship with his fans all over the world and they with him. It was very loving and very special. And lastly, you indicated the environmental message he wanted to share. Is that again something specifically that Michael shared with you? What did he say in that regard? Just that his songs that he had written before, that were about the environment, the planet, the children were as important now as they were when he first wrote them, if not even more important. So he felt compelled that they were out there and are part of the show experience. What was the reason for moving from Center Staging in Burbank then to the Forum? Was that indicative of the progress of the rehearsals that the production was growing in size? What time period were you at the Forum conducting rehearsals, what month? At some point, toward the end of June 2009, did the production move to the Staples Center? Do you recall when that was? Just within that week prior to his death? What was the reason for moving from the Forum to Staples Center? Again, a greater space that was closer to the venue that we were going to be playing in London. And which venue was that? What was it exactly that required more space? The ceiling height rigging for lighting and trusses, the stage itself. It’s like a closer example of the venue so we were moving there to have our final rehearsals in Los Angeles before going to London in the closest proximity of a space as we could get. Were there unique aspects of the production that required a larger space? There were gonna be screens, visuals and things of that nature? Yes. We had an enormous 3D movie screen, we had all kinds of production elements, sets, props, costumes, lighting, special effects, pyrotechnics. 3-D movie screen, was that to be part of the actual Tour? What was that going to entail? Michael and I created a number of short films. They were in 3-D that were gonna accompany the live production so the audience would actually have a 3-D concert experience at different moments during the production. Had you and Michael worked with a 3-D screen such as this on a Tour before? No. I don’t think anyone had. I certainly hadn’t. You mentioned, when you began, you would see Michael 3 to 4 times a week. Beginning at Center Stages, daily rehearsal and meeting between you and Michael, what would it entail? And when you moved to the Forum, specifically asking about your interaction with Michael, was it now moved beyond conceptual? What did it involve now, the Forum? Staging, putting the show on its feet, on the stage. Taking the numbers out of a smaller room and now opening them up to fit on the actual size stage that we would be working with. Once you moved to Staples Center, what was your interaction with Michael? It began at the Center Stages with conceptual, at the Forum it moved to staging and now at Staples Center if you can describe what it involved. Continued staging and running of numbers, tech rehearsal, incorporating the lighting and other elements of the show. As far as the rehearsals; would these be morning, afternoon, night, when did these take place with Michael’s involvement? And typically how long would they last as far as Michael’s involvement? Would that be 5 to 7 hours of physical performance rehearsal or all aspects of the production? As a co-creator with Michael, if agreement wasn’t reached at a particular creative idea, who had the last word? Do u know Conrad Murray or were u introduced to Conrad Murray? Do u see him in court today? Could u identify him please? When did u first met Conrad Murray? I met Mr. Murray at Michael Jackson’s house on Carolwood. I met Dr. Murray there, Michael introduced me to him one day when I came from a meeting at the house. Do u know roughly when that meeting was? The creative process kinda started in mid-April? So maybe mid-April to beginning of May? I would be guessing. I went to Michael’s house for a creative meeting and the doctor was there and he introduced us. So April or May 2009? And this was at Michael’s house on Carolwood? 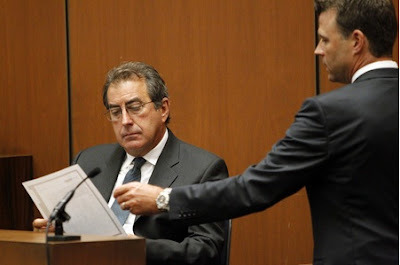 And was Conrad Murray introduced to you as Michael’s personal doctor? Was that pretty much the extent of your meeting with him on that day? Yes. It wasn’t a meeting; it was just an introduction. 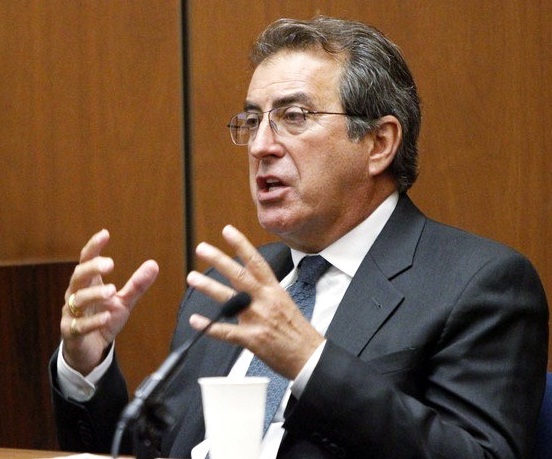 Would Conrad Murray come to the rehearsals from time to time? On a very limited basis but yes he did come. Would this have been at the three locations you described or are there certain locations you recall? No, I never remembered him visiting us at Center Stages in Burbank. Do u recall him visiting at the Forum? Do u recall any visits at the Staples Center? At some point, following you being introduced to Conrad Murray and meeting him, at some point in June 2009, were there a period of days or week where Michael was not showing up to rehearsals? When in June did that take place? So again Michael’s death being on June 25, 2009, using that as a marker, was it the prior week, is that accurate? So the last week at the Forum? What was your knowledge about Michael missing these rehearsals? I assume you were at the location, at the Forum. Would u just learn that he is not coming that day or how would you became aware of it? I was expecting him each day. It became this continued absence. I was only told that it was scheduling. Did u have any reason to doubt that at that time? Now I wanna ask you about Friday June 19, 2009 which I believe would have been one of the last rehearsals at the Forum, do you recall that? Did you make observations of Michael on June 19, 2009 that caused you concern? Can you describe what you personally observe on June 19, 2009? That my friend wasn’t right, he wasn’t well, that there was something going on that was deeply troubling me. By ‘my friend’ you mean Michael? The fact that he wasn’t well and it troubled you, did you see physical manifestations of this that caused you concern? He was chilled. He appeared lost. Just lost and a little incoherent. Although we were conversing, and I did ask him questions and he did answer me, I did feel though that he was now well…at all. Did he get well enough to rehearse? What happened when you made these observations? Did you sit with him? How long did that take place where he was sitting watched the rehearsal with you? Was he still chilled? What was his condition? Had you ever seen him like that previously? Did Michael stay till the end of the rehearsal that night? And had you discussed that with Michael? You’ve indicated this caused you concerns. Did you express those concerns to anybody following the June 19th encounter? Did u in fact send an email expressing ur concerns? Do u recognize that email? Would the only change, you would agree, is that the emails addresses has been redacted? That’s an email from you to Randy Phillips on June 20, 2009 at 2:04am? When u wrote this email, what was ur frame of mind in regard to Michael’s condition? I was deeply concerns and I wanted others to know. The encounter with Michael that caused you concern was the Friday June 19th. I see this is sent on Saturday June 20th at 2:04am. That was a couple of hours after the rehearsal? Mr. Ortega, could u please read the email outloud? May I have some water, you Honor? Does that accurate reflect your thoughts and concerns on June 19th and June 20th? At the beginning of you email, you indicate “we've brought the doctor”. Who is the doctor? What did you mean by bringing him into the hold? Dr. Murray was creating a daily schedule for Michael so that Michael could make rehearsals. And this was in response to that prior week [before his death] where Michael wasn’t showing up to rehearsals? You also indicate “and have played the tough love, now or never card”. Had YOU played the tough love, now or never card? I believe that there was a meeting that was held without my presence. That was about informing Michael that unless he started to show up at rehearsals that it was very possible that we weren’t going to be able to make the goals of the show. And the goals of the show being what? U also state in this email “tonight I was feeding him, wrapping him in blankets to warm his chills, massaging his feet to calm him and calling his doctor.” Calling his doctor, is that Conrad Murray? Were u able to reach him that evening? You then toward the end of the email describe “finally it's important for everyone to know, I believe that he really wants this. I would shatter him; break his heart if we pulled the plug. He's terribly frightened it's all going to go away.” When you are referencing ‘I believe he really wants this’ what are you referencing? Always Michael would talk about how important this was and how we were gonna accomplish this, always just was very positive and optimistic. What is the “he really wants this”. What is the “this”? So when u go onto say “it would shatter him; break his heart if we pulled the plug” you are referencing pulling the plug on the Tour? The next sentence “he's terribly frightened it's all going to go away”. Again, you are referencing the Tour and the production? That would actually be the same day, Saturday June 20th since it was written at 2:04 in the morning. Was a meeting held at the Carolwood address that u attended? Had that meeting been previously scheduled? That day, meaning Saturday June 20th? How did u become aware of this meeting? My assistant told me that we received a call asking me to be at the house. Did u go to Michael’s house at Carolwood? Do u recall what time of day it was? And knowing that you had sent this email the night before, actually that same day, did you know that the meeting was going to center on these concerns or did you speculate or what? The meeting wasn’t broken down to me. I assumed that it would be about Michael. And when u arrived at 100 N Carolwood, who was there? And when u first came into this meeting, did u soon learn what the topic was? And were u confronted by someone? 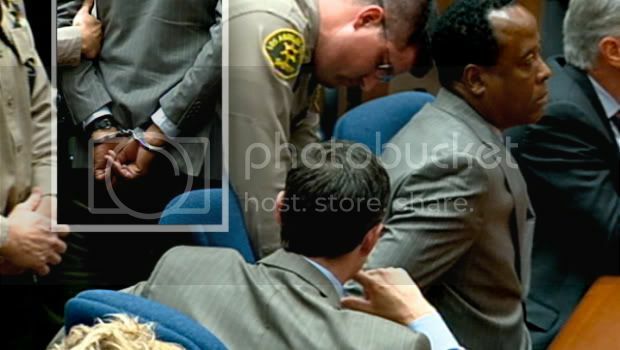 What was expressed to u by Conrad Murray at this meeting? He was upset that I didn’t allow Michael to rehearse the night before and that I sent him home. He said I should stop trying to be an amateur doctor and physiologist and be the director and allow Michael’s health to him. Those were the words of Conrad Murray? You said he was upset that YOU did not let Michael rehearse. Did u respond to that? I did, I said it wasn’t my choice, even though I agreed with it entirely. You agreed that Michael should not have been there? Absolutely. It was m’s request to sit out and watch the show and I felt that was a far safer place for him to be. But according to what Conrad Murray was relaying to u, this upset Conrad Murray? And he told u words to the effect of ‘don’t act like a doctor or amateur psychologist’? ‘Direct the show and leave Michael’s heath to me’? How did u respond to that? What did Conrad Murray assure you? That Michael was physically and emotionally capable of handling all of his responsibilities for the show. B/c Michael didn’t appear to me to be physically or emotionally stable at that moment. What was Conrad Murray’s general demeanor as he made these statements to u? Were u defending yourself, were u responding in kind? How did Conrad Murray respond to that? I said to Michael, ‘Michael, please tell the doctor that is not the way it went down. I didn’t ask u not to perform and I didn’t send u home and this was something that we agreed on together. And Michael said yes, that’s what happened. Michael told me that he was ready to take the reigns, that I should not be afraid, that he was perfectly capable of handling the responsibilities, he wanted to do it, wanted me to stay at his side, told me to believe in him. I told him I loved him, I was concerned for his health and safety. He said I know that. And that’s the only reason why I brought these things up b/c I care about you, I don’t want any harm to fall upon you. He said I’m fine Kenny, I promise you. And he gave me a hug and I left Carolwood. Following that meeting of Saturday June 20th, was the next rehearsal on Tuesday June 23, 2009? Those days in between, Sunday the 21st, Monday the 22nd, there is no rehearsal those days? Of course that same day, the Saturday, there was no rehearsal that day as well? Correct. I don’t know if Michael rehearsed privately but there wasn’t a called rehearsal. Sometimes, Michael rehearsed privately. Going then to Tuesday June 23, 2009, was Michael in the same condition he had been on Friday June 19th? What was his demeanor, what was his condition on Tuesday June 23rd? He entered into rehearsal full of energy, full of desire to work, full of enthusiasm, it was a different Michael. The following day, which would be Wednesday June 24th, did Michael show up for rehearsal that day? The same as the night prior? Going back for a moment to June 23rd, do u remember a production, Michael performing ‘The Way You Make Me Feel’? And on June 24th, was one of the rehearsal numbers the ‘Earth Song’? Do u remember a conversation with Michael on June 24 following the rehearsal where he asked you if you were happy? Can you describe that conversation, please? We had 2 very successful days of rehearsal. Michael was feeling great. He looked at me and he asked me if I was happy and I said I was happy. I asked him if he was happy and he said he was very happy. Do you recall him saying he felt the dream or words to that effect? Yes, he felt like we were accomplishing the dream he saw before him in those rehearsals. The following day which would have been Thursday June 25, 2009. Was there a particular illusion scheduled to take place that day? It was the big illusion that happened in the production. It transitioned Michael from one musical event to another musical event. Michael was standing on a bed in these silk flames sort of obscured him and when the silk flames came down, he vanished and he would rise up on a cherry picker and flowed out over the audience. On Wednesday June 24th, was the fact that this illusion was going to be utilized the following day, was that discussed between you and Michael? Can u describe that please? He was very excited, he loved magic, he loved illusions, we always had them in the shows. He was excited that the apparatus was arriving and that we were going into rehearsals for the illusion. How did the evening come to a close on Wednesday June 24, 2009? Michael was very happy. He asked me to thank everybody, tell them that he loved them, the dancers, the singers, the band, the crew. I told him that I would have everything prepared for him the next day by the time he arrived so we could step right into the illusion rehearsal. I told him that I loved him and he told me that he loved me more. I gave him a big hug and he left the building. The next day, Mr. Ortega, did you respond to Staples Center on June 25th to begin work on the illusion and the rehearsal? At some point while you were at Staples Center, did you learn there was a very serious issue with Michael taking place? That an ambulance that had left Carolwood, in fact, was carrying Michael Jackson and that Michael was at the Hospital and that he was in with the doctors and he would call me back when he knew more. Did you then get a subsequent call? And what did he tell you? And you learned thru that phone call that Michael had been pronounced dead? What did u do at the Staples Center at that time? It took awhile for me to even feel my feet on the ground. And it was clear that everyone in the room was getting text messages and phone calls and that the word had spread. I called everyone to the floor; the entire cast. We all joined in a circle and I informed them of Michael’s passing. Mr. Ortega have you previously identified this particular track I am about to play this particular performance of “The Way You Make Me Feel” as the one that was performed on June 23, 2009? Mr. Ortega, the rehearsal performance we just saw, that is from June 23rd? The dancers that Michael is performing is performing with, what is their average age? And did that video clip accurately reflect Michael’s overall demeanor that night? Of camera, at the end, there was a voice being heard. It sounded like your voice, was that you? At the point where Michael was speaking, he appears to look behind him and he says something to the fact of ‘that’s okay, that’s why we rehearse’. Did you hear that? There was some mistake made or something? This performance from June 24, 2009 of ‘Earth song’, was this in fact Michael’s last performance of any kind on stage? It was a rehearsal. I was his last rehearsal. Mr. Ortega, regarding what we just observed, ‘Earth Song’ on June 24th, that was the last rehearsal, the last time Michael was on stage performing that night? Following that performance of ‘Earth Song’ that night, what happened? Michael stepped off the stage and joined me in the arena and together we watched the next part of rehearsal together. Travis Payne stepped on stage for Michael. And we ran ‘Heal the World.’ so that Michael could look at the lighting elements, the scenic elements, the staging. You referenced earlier a conversation with Michael about asking are you happy, very happy and talking about the Tour. Where in time did that take place? During the rehearsal of ‘Heal the World’ I was breaking it down for Michael as to how we were going to fully imagine it. So he was looking at the stage, not only the rehearsal that was in front of us but imagining things that were still to come. That’s when we had our conversation, after the number. Did you and Michael discuss touring plans beyond his Tour that the two of you hoped to engage in? Can you describe what you discussed as far as the future plans as part of the ‘This Is It’ Tour? Michael had hoped that after the London dates, he would be able to take ‘This Is It’ out into the world; perhaps even bringing it to the Unites States. And after that, he wanted to do movies. Did you specifically discuss that with him? What movies did he wanna make? He invited me to join him as a co-director to a full length feature film of Thriller. Also the Legs Diamond Story which was based on his Smooth Criminal short film. These discussions that you had actually contemplated pursuing those endeavors following the tour? We didn’t get into the details but it was just an invitation and a hope. Thank you, sir. Nothing further, Your Honor. Mr. Ortega, how are you today? I wanna go straight to June 20, the meeting at Michael Jackson’s house. This was at the Carolwood residence where he resided, is that correct? We have seen this email that was put up on the screen that you read for us. That email was sent, obviously, prior to the meeting being scheduled? Prior to sending the email to Randy Phillips, did you speak to him on the phone about what had happened on June 19th? So this was just an email that u sent cold, essentially ‘this is how I feel about certain things that are happening at this particular point in time with regard to the show? You had said that the meeting that was scheduled at the Carolwood residence you found out from your assistant? Did you happen to know whether or not it was Paul Gongaware who scheduled this meeting? To ur knowledge, was this meeting scheduled by Dr. Murray? I wasn’t told who the meeting was scheduled by. I was just invited to the meeting. It could have been scheduled by Randy Phillips? Would you agree that one of the conversations that you were going to have, one of the reasons for having this meeting was to discuss these missed rehearsals? One of the reasons for having this meeting was to discuss Michael Jackson’s missed rehearsals? Your email talks about playing tough love, pulling the plug. Was it ur understanding that what you were referring to was, perhaps, some resolution to the problem of Michael Jackson missed rehearsal? My comments were based on meetings that probably occurred before this night where Michael was informed that we had to get serious about coming to rehearsals. The June 20th meeting was not the only meeting that was held at Michael Jackson’s house regarding missed rehearsals, correct? Probably not? Are you guessing? Are you aware of another meeting that was held at Michael Jackson’s house? Not aware of it but most likely there was one b/c I know that Dr. Murray was creating a schedule for Michael to try to help resolve the problem of Michael missing rehearsals. You testified that the schedule that Dr. Murray was creating was as a result of a week prior to his death. Are you saying that the schedule that he was creating was a result of a meeting before the 20th? I understand that. lemme ask you this. Who asked Dr. Murray to prepare a schedule for Michael Jackson? Is it possible that this schedule that was created by Dr. Michael was created week prior? Do you know when Dr. Murray was asked to create this schedule? I don’t know if he was asked or if he offered. I just know that it was truly an attempt to try to help us arrive at a schedule that would work for Michael. Prior to this June 20th email that was sent to Randy Phillips, had you expressed concern about Michael Jackson’s missed rehearsals? Would it be fair that you expressed your concerns earlier than the last week before his death? These missed rehearsals; these were at the Staples Center and/or also the Forum? What was ur impression why Michael Jackson was missing these rehearsals? You have already testified to Michael Jackson’s state of mind. Do you think he was missing these rehearsals just b/c he was tired or lazy? Did u have a conversation with anybody about why he was missing these rehearsals? Who did you have that conversation with? One of those people was Randy Phillips? In your email, when you talked about “it would break his if we pull the plug” is this a conversation that you had with Randy Phillips or that Randy Phillips had with you about pulling the plug? No, it was based on me as a director of the production, having real questions as to whether or not we were going to be able to make the goals without Michael. If the plug had been pulled on Michael Jackson, what impact would it have on him personally? Creatively, he would have been devastated. He really wanted to do this Tour. Professionally I’m sure it wouldn’t have been a good thing. You said you worked on the Dangerous Tour with Michael? You also worked on the HIStory Tour? To ur knowledge, did Michael Jackson have any Tours after the HIStory tour? I know he did perform on a New York Engagement. I don’t think he had any tours but I believed that he performed on occasion once or twice. So the last time that Michael Jackson had a Tour was in 1996? The meeting that you had on June 20th at Michael Jackson’s house, you described a conversation with Dr. Murray. Would you say it was adversarial, the conversation you had with Dr. Murray? Can you rephrase that sir? Were you fighting? Was it adversarial? You mentioned what Dr. Murray said to you and what you said to Dr. Murray. Was there anything else that was said beside the statements you already testified to? “It could have been”? Do you remember any of those statements? I just remember that what Dr. Murray was saying to me was not exactly what had occurred. And at one point, Dr. Murray looked to Michael b/c Michael was his source of information and he was looking to Michael like Michael had said one thing and I was saying another so there was a moment of clarity which was based around his assumption that I had taken Michael off, not allowed Michael to rehearse and sent him home which wasn’t the case. And you were not privy to the conversations that Michael Jackson and Dr. Murray had prior to your arrival? You do not know what Michael Jackson might have told Dr. Murray about the encounter the night before? How long was this meeting, Mr. Ortega? Would you estimate for us? Is it your testimony today that the entire meeting lasted 10 minutes? The portion of the meeting that I was involved in, cause I left before everyone else left, felt brief. Why did you leave before everyone else? B/c that is what I was called for, that conversation. You know who Karen Faye is, correct? And who is Karen Faye? Michael’s hair and makeup artist. She was the hair and makeup artist on the ‘This is It’ rehearsal? Do you recall telling Karen Faye that you read Michael Jackson (*Ortega smiles and shakes his head no), well, lemme finish, you might remember it, that you read Michael Jackson the riot act? Do you remember directing Karen Faye not to placate Michael Jackson? I remember Karen Faye being there on the 19th and being as concerned as I was and everyone else that was in that small circle. I remember seeing Karen Faye on the Tuesday…. Mr. Ortega. Did you tell Karen Faye not to placate Michael Jackson? Well did u tell her not to placate Michael Jackson and used a different work? I might have told Karen Faye that Michael told that he was taking the reigns and that he could use your support. So the answer is no? You didn’t tell her that? Would u agree with me that your success was somewhat tied to Michael Jackson’s success in ‘This is it? If ‘'This Is It'’ was a successful show, that would certainly reflect upon you as well as Michael Jackson. So u when u talk about Michael Jackson having a desire to complete ‘'This Is It'’, you also had that same desire? Would u agree with me that without Michael Jackson showing up to rehearsals, that would impact you personally as well as Michael Jackson individually? And that was important to you, you doing ur job? You talked about Michael Jackson being involved in the production of ‘'This Is It'’, is that correct? He was not just involved; he was VERY involved in the production, correct? He wasn’t just co-choreographer or co-director in name only; it wasn’t an honorary title, right? He was intimately involved in the decision making? In fact you mentioned a particular, was it a 3-D effect that he himself had come up with, is that right, it was his idea? But you had never even seen it used before in a staged show? Would it be fair to say that Michael Jackson was involved in all of the effects that were involved in the show? Are you talking about the 3-D effects? Yeah, did he have a hand in all of the effects? And he told u that this was his time, this was it for him, is that right? And what you understood him to mean by that is he understood the historical significance of what he was about to do? You mentioned that at the conclusions of these shows, Michael Jackson was planning movies? And at the conclusion of these shows, you also discussed with him taking the show on the road, taking it onto a Tour? That was something that you had talked about? On the June 19th rehearsal, would it be fair to say that Michael Jackson’s condition scared you? Had you ever seen him that way? On any occasion, during the rehearsals for ‘This is It’ did it ever strike you that Michael Jackson might have been on drugs? Had you every met or personally known a man named Dr. Arnold Klein? How did you know who he was? You’ve been introduced to him? When you first met Dr. Murray, you said that it was at Michael Jackson’s residence, is that correct? You said that you’d seen him at a rehearsal, at the Forum? You testified you did not believe you saw him at the Staples Center at all? But you do remember once at the Forum? Did u have any conversation with Dr. Murray? Did you initiate that conversation? He seemed concerned about Michael Jackson? Did you take him up on that invitation? Did you take his phone number? Were you part of the meeting where Dr. Murray made suggestions about Michael Jackson’s schedule? And you recall that one of the suggestions he made is that Michael Jackson should be permitted to have lunch with his children? The rehearsals at that time were much earlier than they ultimately wind up being? Do you recall any conversation with Dr. Murray about the diet that Michael Jackson was on, the food that he was eating? I don’t recall a conversation about that. You had said that the rehearsals went from Burbank Center Stages to the Forum. I don’t think I heard exactly when you said that move happened. Can u tell us when you exactly went to the Forum? In May, the rehearsals were still at Center Stages in Burbank? U told us that at Center Stages, you and Michael Jackson had creative meetings. I guess u talked about what u r gonna have in the show, and things of that nature? Was that thru May and thru April? As u move to the Forum, would it be fair to say that the rehearsals became a little more active, there was rehearsals on the stage with Michael Jackson? And when u moved to the Staples Center, even more things were incorporated into the show, like effects and magic acts? I wanna bring your attention to the week prior to Michael Jackson’s death. I’m gonna tell you that the Monday on that week was June 15th. Is that how you remember it? That week of June 14 / June 15, 2009. The rehearsals were scheduled at the Staples Center. Is that correct? June 15 thru June 19 would be Monday thru Friday. When did u move to the Staples Center? I think we moved to the Staples Center like the Tuesday or the Monday or over that weekend. I am guessing that b/c we were gonna be at the Staples Center for two weeks. We were at the Forum for a longer period of time. The following Tuesday would be the 22nd of June. You are saying that the week Michael Jackson died is the first week you moved to the staples Center? So you had exactly 2 rehearsals at the Staples Center? That’s what I’m guessing sir. I don’t have a calendar in front of me and I don’t recall exactly but I think it was a short period of time that we were at the Staples Center. During these rehearsals and we have seen this video, these rehearsals were actually video-taped, is that right? And so were the rehearsals from June 15th thru June 19th? Is it your testimony today that if M was not there, u simply did not record? I didn’t have any reason to. Michael recorded rehearsals for his own benefit. No one photographed or recorded rehearsals until we had our actual cameras that were gonna be used for the I-Max screens which came late at the Forum or early at the Staples Center. So there were no other people that were recording other than when Michael requested recording. Mr. Ortega, after the death of Michael Jackson, you were hired to help edit video tape for the movie ‘'This Is It'’? You were hired by Sony pictures? And u sat in a room at Sony pictures for two months? We had video footage that was taken, interviews of the band, and the dancers, and the singers that was gonna be used for a later behind the scenes of a filming if ‘'This Is It'’ in London at some point. So there was that, yes sir. This video tape that you edited had date stamps on them; they were labeled by the date? I’m not quiet sure what you are getting at. Here is what I am getting at. You reviewed all the rehearsals. You spent 2 months reviewing all the rehearsals. But you don’t remember where the rehearsals were had the week before his death? On June 19th, there is a videotape, is there not, of Michael Jackson sitting on a chair, with a blanket wrapped around his shoulders. Have you seen that video tape? On June 18th, Michael Jackson missed his rehearsal; he didn’t show up, right? Well he was missing for a period of about a week. I am not exactly sure what day, but he was missing for a period of about a week in that area. Thanks you so much, Mr. Ortega. Judge: Redirect examination, Mr. Walgren? Walgren: No thank you, Your Honor.